That’s right, I have two of them now. The behemoth has a brother. Romulus has found its Remus. It’s like when R2-D2 met C-3PO; one is established and useful, the second is a scrappy, half-finished up-and-comer. I honestly wasn’t out looking for another one. My Wyomingite friend Craig has been looking to unload some underused gear, though, and asked if I’d be interested in anything. The prices he offered were impossible to pass up. So I offered to save him the trouble of posting the Pentax 67 Super-Multi-Coated Takumar 300mm f/4.0 and cold-weather battery adapter on eBay. He give me a quote and even offered to sweeten the deal by throwing in a first-generation (non-MLU) body, too. I couldn’t resist. This lens is huge. It’s seriously the size of a classic Stanley Aladdin thermos bottle. And it weighs about 65 pounds. Okay, 3.15 pounds, technically, but it screams for a tripod. Or at least a monopod. You can see it’s about four times as long as my SMC Takumar 45mm f/4. 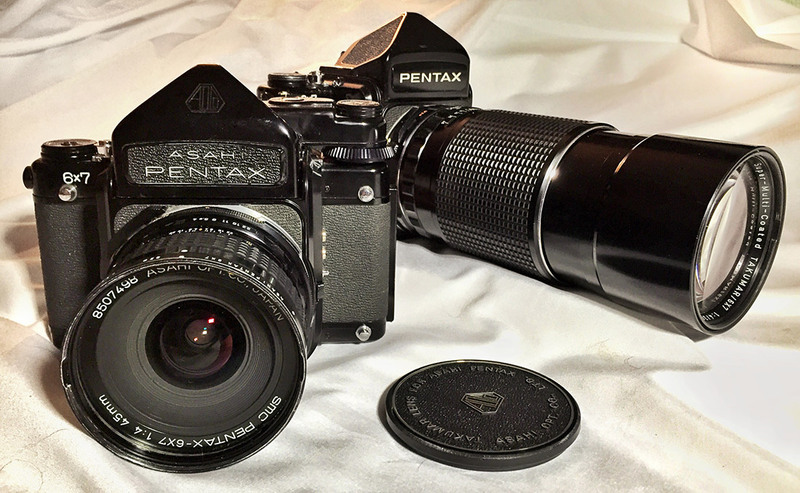 In spite of its apparent enormity, however, the 300mm f/4 is only equivalent to a 135mm lens on a 35mm camera in terms of field of view (as calculated based on the actual frame size of a Pentax 6×7 image, 55×70 millimeters). Some reports indicate that it’s not the sharpest lens in the 6×7 lineup, but overall its stats look pretty good. The body Craig gave me is a first-generation 6×7, before mirror lockup was added in 1976. Functionally, it’s otherwise the same. It does have some interesting differences — the kind that don’t really matter, but stand out once you’re really used to things being one way. The film spool holders have knurled surfaces you push and twist, rather than the flip-up latches of the second generation, though the battery holder still uses the latch. Some surfaces are raw stainless instead of sporting the later models’ enameled finish, such as the battery holder and lens release switch. The focusing screen has a microprism in the center circle and no split image (and seems a tad more dim). There is no start mark for 220 film, though the frame counter still has a 120/220 switch. 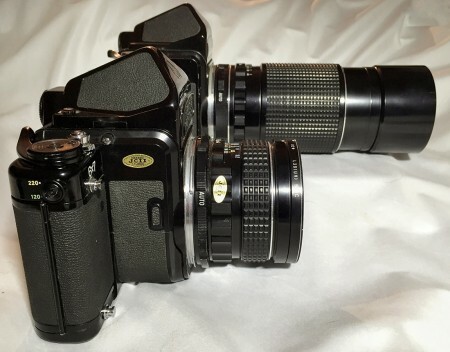 The film advance lever is a slightly different shape. That’s about it — it’s not a long list. Craig didn’t give me a viewfinder, but that worked out. I bought a TTL metered prism finder for my first body and still had the non-metered prism waiting in the wings. And so I now have two fully-functional 6x7s. Craig and I spent the rest of that Sunday doing a little photography in northeast Colorado. Had a great time. It’s always a blast to be in the field with another like-minded photographer, always a learning experience. 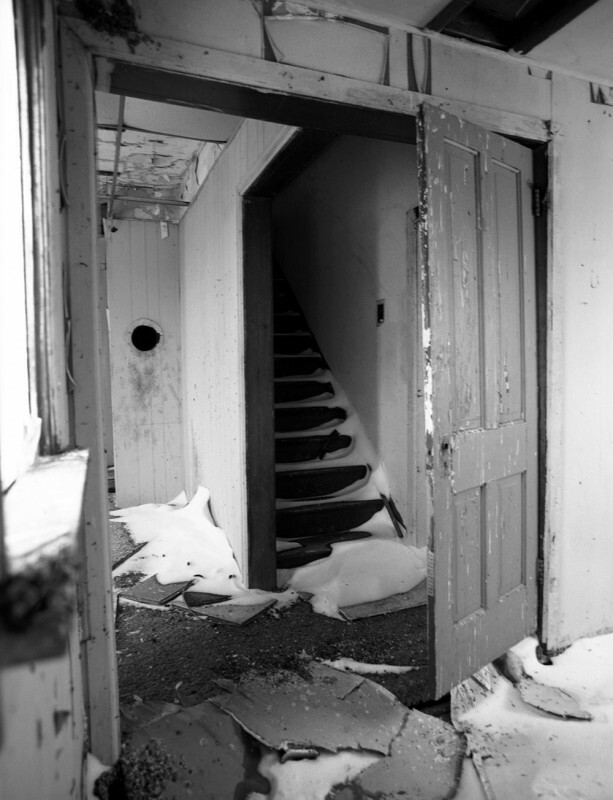 We talked about Edward Weston making contact prints with a bare bulb in a tiny home darkroom, the merits of warmtone paper, and a dozen dozen other topics. In the process, my main 6×7’s shutter started sticking open. Since I’d just added it to my bag, I broke out the cold-weather battery adapter and dropped the battery in my pocket. It didn’t help, though, unfortunately. I tried the body Craig had just given me, too. So, it seems that the 6×7 might just have some mechanical troubles in cold weather. It was about 35 degrees Fahrenheit, so I really wasn’t expecting trouble. What I really think is that it means I need to get these guys CLA’d. Probably the remains of the 40-year-old lubrication just turned to molasses in the cold. I did learn that tucking the camera inside my jacket when I’m not actively using it helps a lot. But with two, I can expand the range of my eventual review of the medium-format behemoth. I still managed to finish seven rolls of film, and only lost about 10 frames to the shutter issues. Consider this another sneak peak. I got some cool Secret Santa gifts as part of the EMULSIVE event, but the real joy was packing up some of my own stuff and sending it off. More gratifying was seeing the excited reveals from the recipients. Following the guidelines, and because I was so excited to pick stuff out for others, I signed up both as myself and as Schneidan.com. 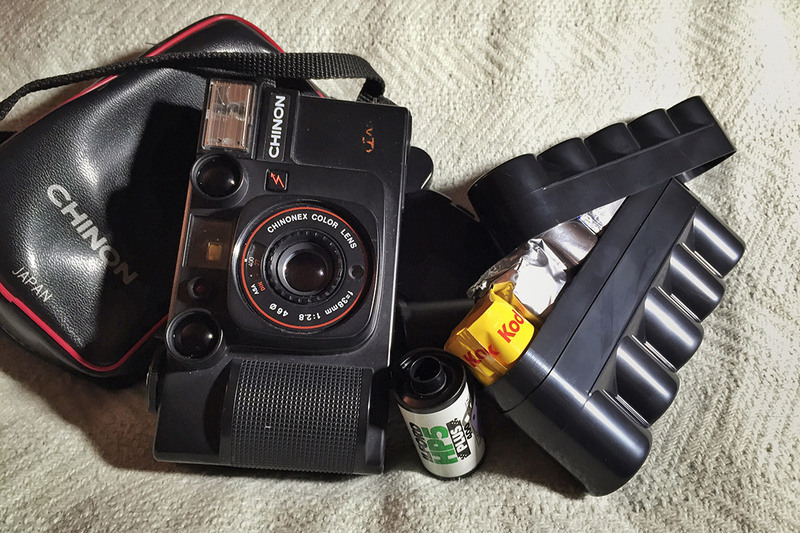 In spite of a note on the second account stating there was no need to send anything, I got a spiffy Chinon camera and a roll of film from that Santa. My personal Secret Santa fulfilled a long-time wish by sending a JapanCameraHunter 120 film case. I couldn’t contain myself and stuffed it full of film before I even took a picture. It’s late on Xmas Day as I write this, and several inches of snow have already fallen in the Front Range. The hospitality and generosity I’ve been blessed with today and throughout this holiday season have been overwhelming. Thanks to those who’ve contributed, and Merry Christmas to all!